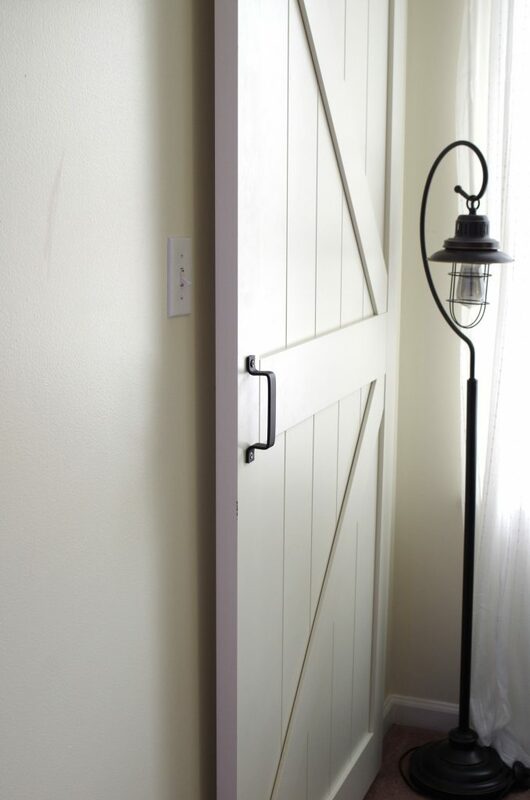 Thank you to Wayfair for sponsoring today’s post about why I love my Sliding Barn Door. 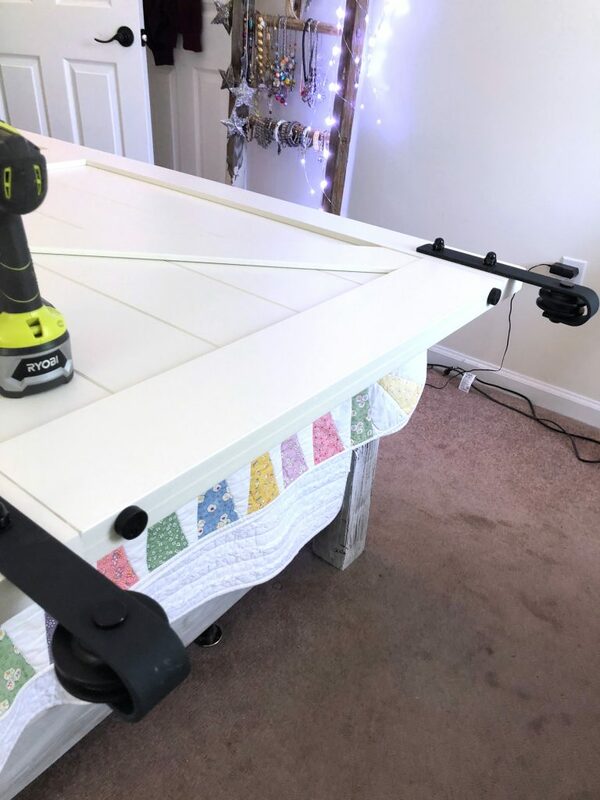 Why do I love my new sliding barn door that was sponsored by Wayfair? My little walk-in closet was half-blocked by the traditional door that was there. 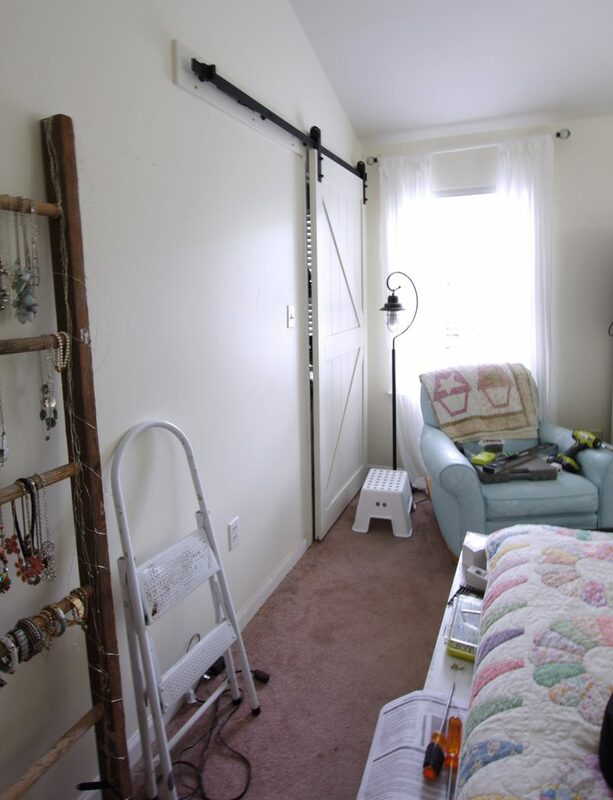 Now I have access to the whole closet thanks to this sliding barn door. I know. You’re not supposed to love inanimate objects. But this is different. I really do love my new sliding barn door. 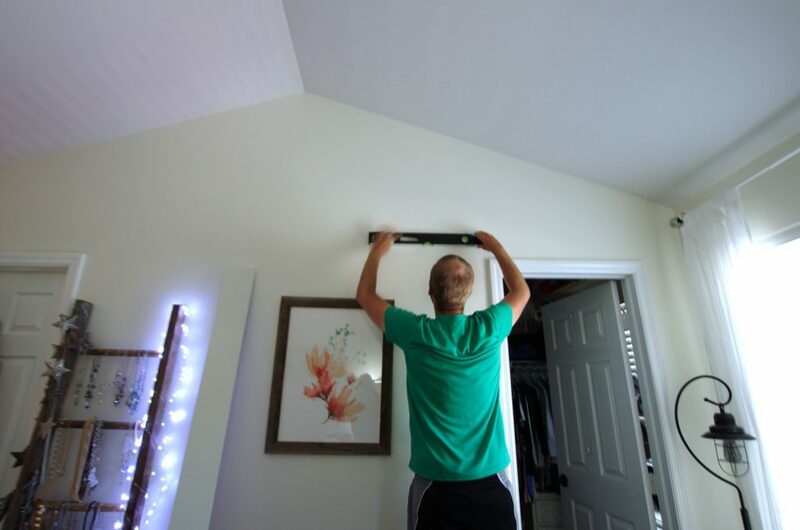 Do you all remember how I remodeled my master bedroom last year? How I had to do it over two One Room Challenge events instead of just one? That bedroom underwent quite a transformation just by repainting the orange walls alone! Now. Now it’s perfection. To me anyway. 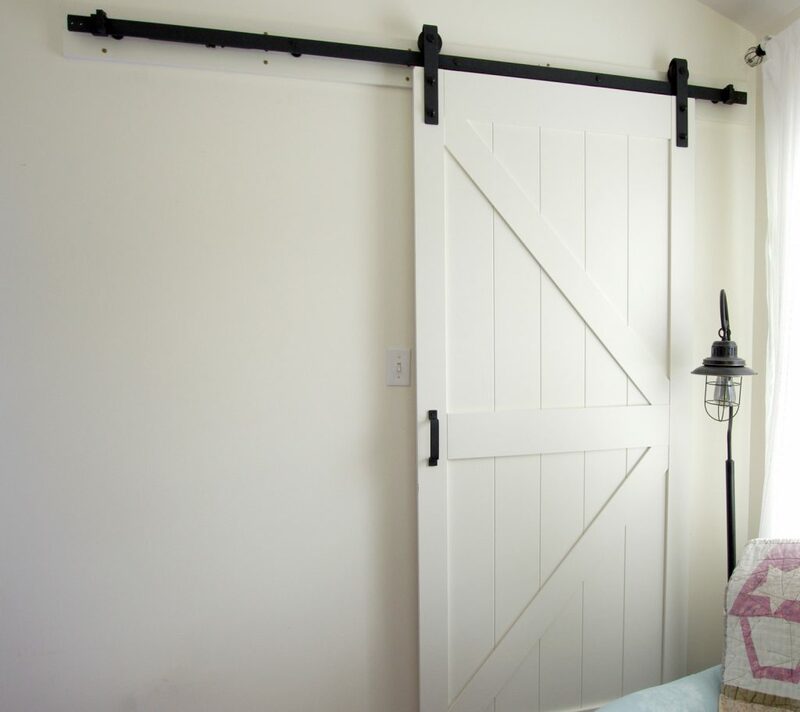 Since the room has a farmhouse vibe to it, especially with the farmhouse style bed I built, I kept thinking about how a sliding barn door would look in place of one of the regular doors. There are three doors in this room and any one of them would be a good candidate to be replaced with a sliding barn door. 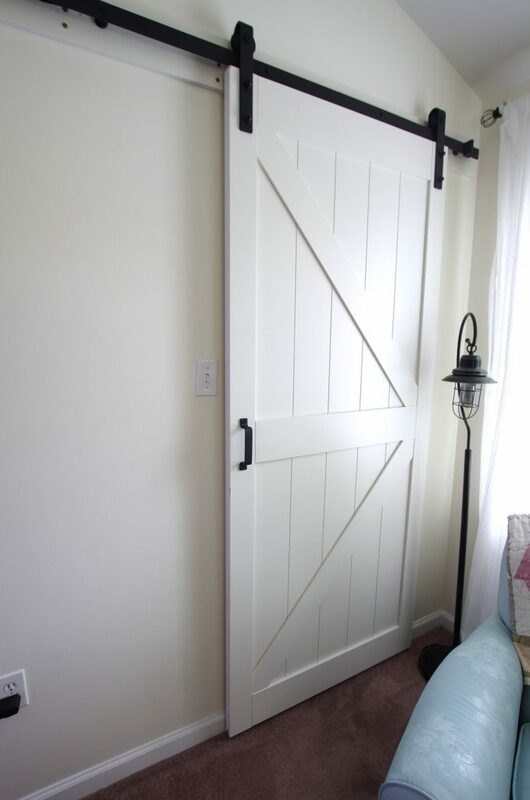 So when Wayfair asked me if I was interested in writing about sliding barn door, of course I said yes! And the more I thought about those three doors, the more I thought that the closet would be a perfect location for this sliding barn door. Why? Well because the door that was there was opening into the closet, completely blocking one whole wall of this tiny walk-in closet. And as you well know, every inch of closet space, especially in a small house is valuable real estate, right? We started out by installing the “straps” on the door. That was easy and only took a few minutes. 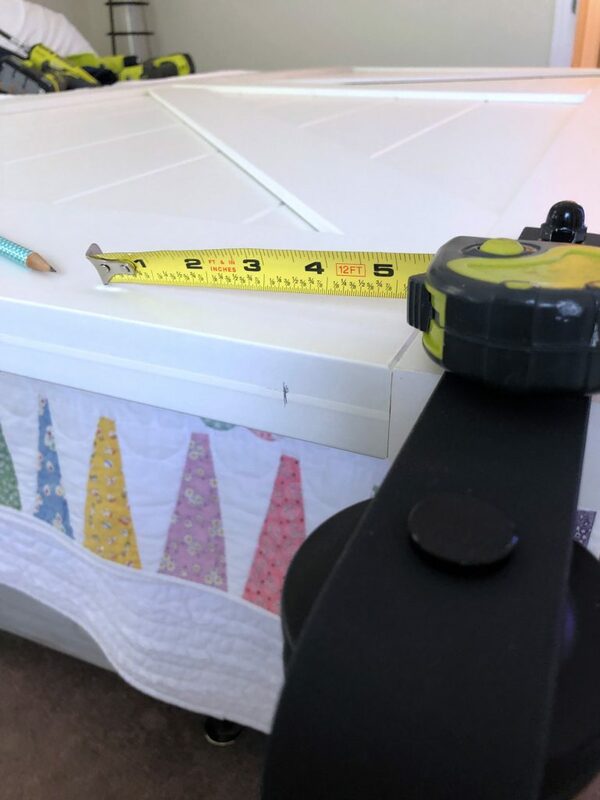 Next, we measured for and installed the “anti-jump” blocks. Then it came time to get the wall ready for the installation of the “solid wood blocking”. We found and marked the studs in the wall. 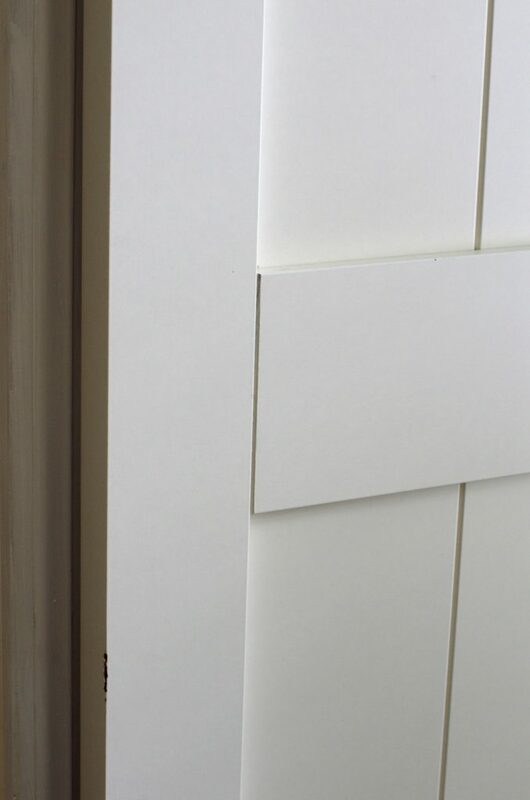 And securing this wood block with several 2″ wood screws through the block and into the drywall and studs. The instruction didn’t specify it, but you need to provide your own screws for this step. The instructions also didn’t say how many or what size screws to use. So we decided to use three on each stud. This may be overdoing it, but it’s a heavy solid door! The next step was to install the track. All of the hardware was included for this step. This is also where a second set of long arms comes in handy! All that’s left to do now is hang the door . . .
. . . and install the handle. And it’s done and I love it! (Notice how I’m not showing any pictures with the door slid open??? It’s a mess behind there. Remember, I told you that I have some reorganizing to do in there! What do you think? 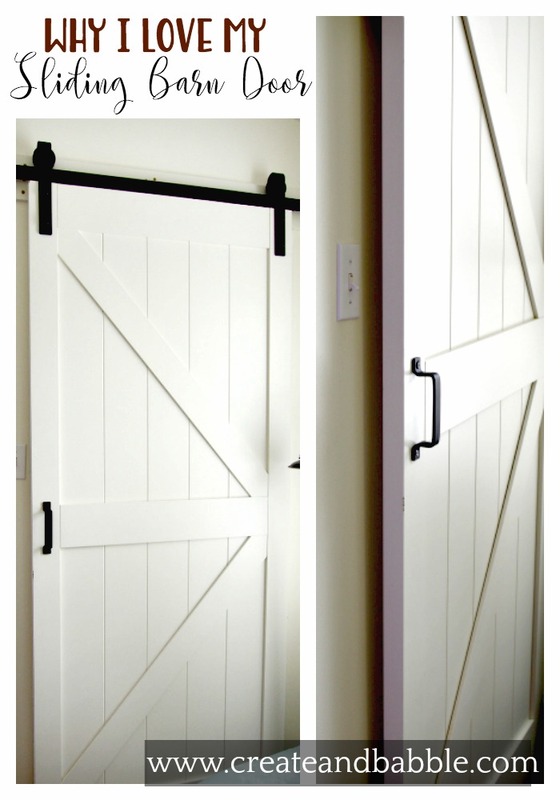 Is there a spot in your home where a sliding barn door would be perfect? I have to say that the installation was a lot easier than I thought it would be. You know how big sized projects can look so intimidating? 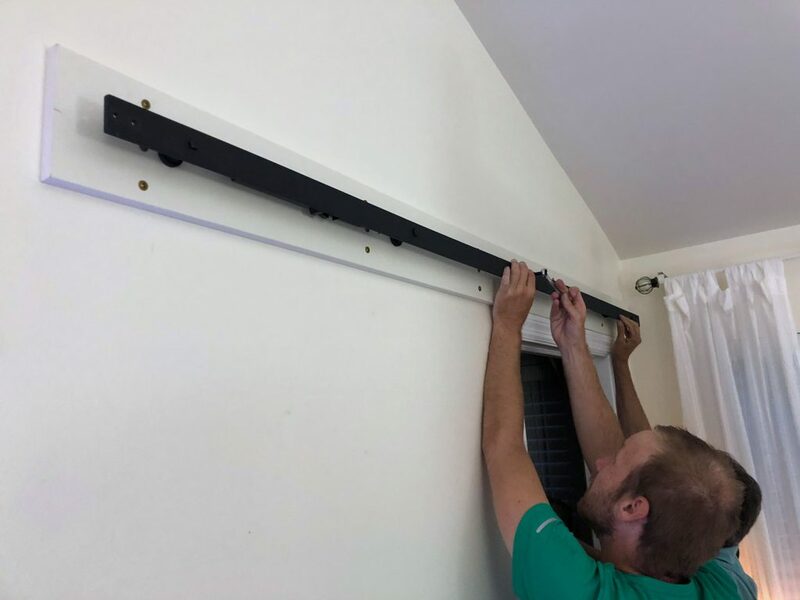 Well, I am happy to say that this wasn’t hard at all and was installed in just one afternoon. It looks great!! I have one in our guest room but I want another one!! Thanks Debbie! I don’t think you can have too many! I’d love to replace the other two doors in this room with them too! I love your sliding barn door. Great way to give your home a farmhouse feel. Thanks for sharing on Sunday’s Best. Wow! 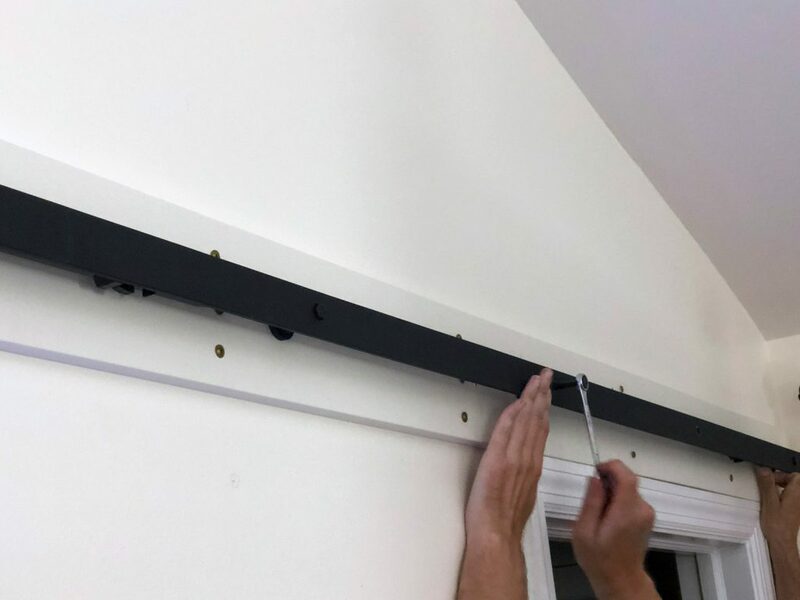 I can’t believe how easy this is to install. I’m like you, sometimes I look at big projects and think it is going to be difficult and time-consuming. Love it when they turn out easier than you think. Thanks for sharing your installation and beautiful new door with us at Merry Monday this week! I love barn doors! I have a double in in my craft room. My friend remodeled her bathroom last year and asked me for suggestions. I told her to add a barn door. She did and loves it too. Thanks for sharing with SYC.